There are tens of thousands species of fish, not to mention all the other aquatic animals. Their habitat covers three quarters of the planet, and yet we don't know them; because of that, we decimate them on a large scale in terrible conditions. Consideration for animals is increasing, but hardly for fish, even though they represent the huge majority (95%) of the victims of animal consumption. It is from 1000 to 3000 billion fish that are killed every year. We attend this inconceivable massacre without doing anything. Fish do feel pain. They all have a distinctive personality traits and they recognize individually their congeners, with whom they communicate. 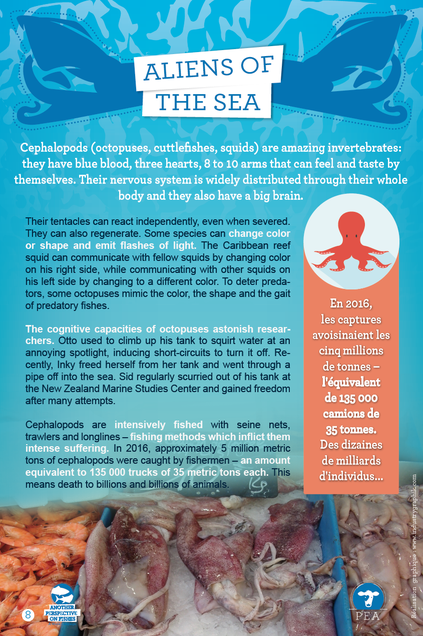 Octopuses and squids also have remarkable cognitive capabilities. They feel pain too, just like lobsters, crabs and shrimps. It is not because we often have spontaneously less sympathy for aquatic animals that their life and their happiness have less importance – it is their life, their happiness which matters first of all, before our sympathy, our preferences. Our planet contains an outstanding diversity of fish species. They are much more fascinating than we suspected. Many observations and searches show that a lot of fish have a very elaborated conscience. They have a complex social life, they build alliances (sometimes with individuals from other species), show strategy, calculate the costs and benefits of their acts, communicate in an elaborate way, learn and long remember, are curious and perceptive, etc. Contrary to a persistent legend, fish have a long-term memory. Salmons find their native river back (by the smell), after having spend years thousands of miles away. They sometimes demonstrate skills we wouldn't suspect them to have. 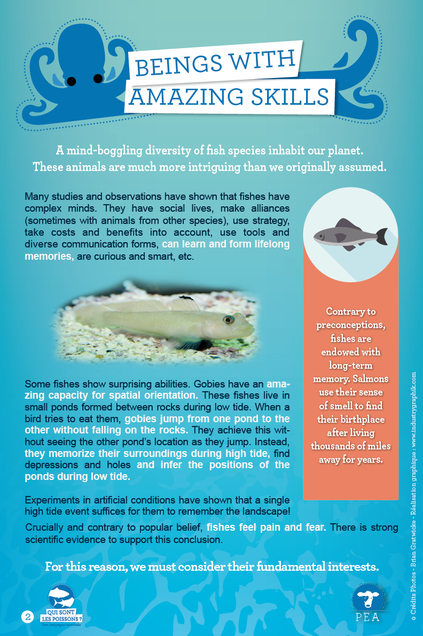 Gobies thus show some surprising spatial habilities. These fish live in small ponds which form at low tide among rocks. When a bird tries to eat them, gobies jump from one pond to another, without smahing into the rock. And yet, they can't see the other pond ! In fact, they memorize the nearby landform during high tide, visualize the recesses and then deduce the location of the ponds at low tide. An experiment conducted in an artificial pond has shown that they only need one high tide to memorize the topography of the pond. Above all, and contrary to popular belief, fish feel pain and fear, as it has been scientifically prooved. It is the reason why we must take their interests into consideration. Cephalopods (octopuses, cuttlefishes, squids) are amazing invertebrates: they have blue blood, three hearts, 8 to 10 arms that can feel and taste by themselves. Their nervous system is widely distributed through their whole body and they also have a big brain. Their tentacles can react independently, even when severed. They can also regenerate. Some species can change color or shape and emit flashes of light. The Caribbean reef squid can communicate with fellow squids by changing color on his right side, while communicating with other squids on his left side by changing to a different color. To deter predators, some octopuses mimic the color, the shape and the gait of predatory fishes. The cognitive capacities of octopuses astonish researchers. Otto used to climb up his tank to squirt water at an annoying spotlight, inducing short-circuits to turn it off. Recently, Inky freed herself from her tank and went through a pipe off into the sea. Sid regularly scurried out of his tank at the New Zealand Marine Studies Center and gained freedom after many attempts. 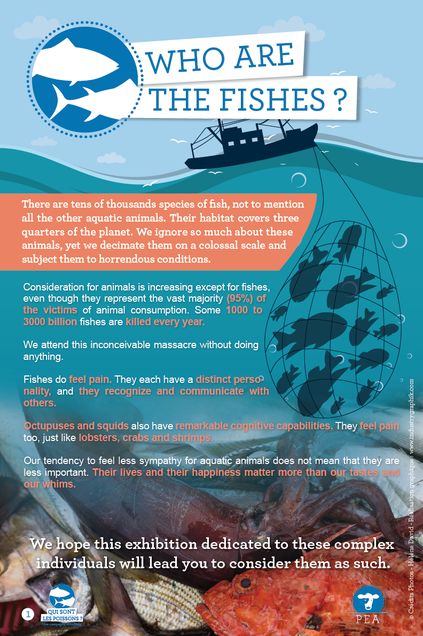 Cephalopods are intensively fished with seine nets, trawlers and longlines – fishing methods which inflict them intense suffering. In 2016, approximately 5 million metric tons of cephalopods were caught by fishermen – an amount equivalent to 135 000 trucks of 35 metric tons each. This means death to billions and billions of animals. Crabs, shrimps, lobsters and crayfishes are targeted by massive fishing operations. Intensive shrimp farming is growing exponentially. In 2016, fishing and farming each killed 7 million metric tons of sentient beings – several hundred billion deaths. The fishing of these crustaceans devastates the sea floors. Two thirds of catches are comprised of other marine animals, so-called “bycatch”. 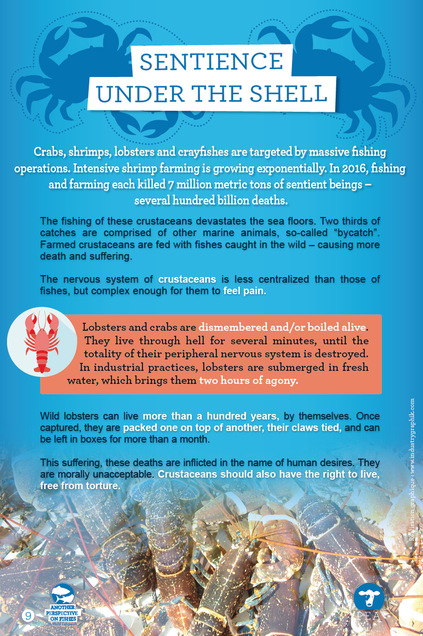 Farmed crustaceans are fed with fishes caught in the wild – causing more death and suffering. The nervous system of crustaceans is less centralized than those of fishes, but complex enough for them to feel pain. Lobsters and crabs are dismembered and/or boiled alive. They live through hell for several minutes, until the totality of their peripheral nervous system is destroyed. In industrial practices, lobsters are submerged in fresh water, which brings them two hours of agony. Wild lobsters can live more than a hundred years, by themselves. Once captured, they are packed one on top of another, their claws tied, and can be left in boxes for more than a month. This suffering, these deaths are inflicted in the name of human desires. They are morally unacceptable. Crustaceans should also have the right to live, free from torture.